Adhirath Reddy (left) receiving the man of the match award. Hyderabad: M Adhirath Reddy blasted a 54-ball 84 (10×4, 3×6) to steer Medak Mavericks into the final of the Venkataswamy Memorial Telangana T20 League on Saturday. 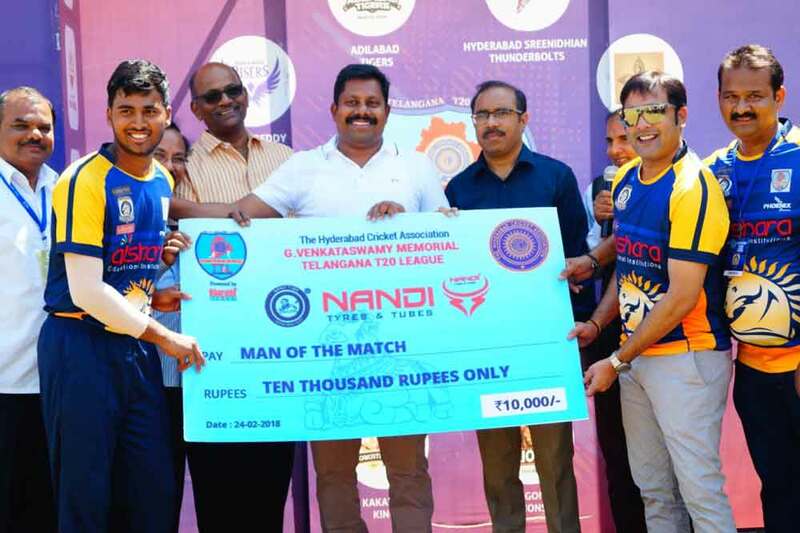 In the semfinals, Mavericks crushed Hyderabad Sreenidhian Thunderbolts by six wickets to set up a summit clash with Adilabad Tigers, who beat Ranga Reddy Risers by 16 runs. Asked to bat first, Hyderabad Thunderbolts posted 150/7 in the stipulated 20 overs. KDK Chaitanya scored 43 while Chandan Sahani made 31 runs. For Mavericks, Praneeth Raj, Chaitanya Krishna and Mickil Jaiswal scalped two wickets each. Chasing 151 for a win, Adhirath Reddy smashed the Thunderbolts attack while in-form J Mallikarjun scored 31. In the other semifinal match, Adilabad Tigers raced away to a challenging 182/7 in 50 overs. Mir Jaweed Ali hit a belligerent 24-ball 45 (2×4, 5×6) while Neeraj Bist, too, made a significant contribution by hitting 40 (22 balls). Ranji opener Akshath Reddy hit a quick-fire 81(39 ball; 4×4,6×6) but his fine effort went in vain as Risers finished at 166 in 19 overs. Hyderabad Sreenidhian Thanderbolts 150/7 in 20 overs (KSK Chaitanya 43, Chandan Sahani 31; Praneeth raj 2/49, Y Chaitanya Krishna 2/16, Mickel Jaiswal 2/20) lost to Medak Mavericks 151/4 in 19 overs (M Adhirath Reddy 84 no,J Mallikarjun 31). Adilabad Tigers 182/7 in 20 overs (Mir Jaweed Ali 45, Neeraj Bist 40,Hima Teja 40; Prudhvi 2/32, Radhakrishna 2/37) bt Ranga Reddy Risers 166 in 19 overs (P Akshath Reddy 81; T Ravi teja 2/46, Karan Mannan 2/27, N Rakesh Goud 2/33).